I'm spending some time in Vitória, Brazil, and have been using a bit of the public transportation. The buses, unlike any I've seen in other cities, have an on-board turnstile, where you must pay a cashier before entering the main part of the bus. However, in front of the turnstile, and behind the driver, there is always a single row of seats--two on each side of the center isle. I often see people sitting in these seats, and they don't appear to pay, and they later hop off the bus through the front doors. What are these seats for? Who is permitted to use them, and under what circumstances? Do these passengers not pay, or do they have some sort of privileged access? I confirmed this with a few Brazilians (I'm currently in São Paulo). Depending on the bus and the bus route, the turnstile might be at the front or a bit more to the back. This is related to whether the bus needs doors for entry on both sides. The turnstile needs to be after the entry door located furthest to the back. Exit is through one of the back doors, after the turnstile. This means that though there might be seats before the turnstile (for practical reasons), to exit you will have to go through the turnstile and pay. This does mean that you can exit without paying, but it's also quite possible that what you saw were people paying but not going through the turnstile (perhaps because it was too busy in the back of the bus). Additionally, it seems to me that Brazilians are mostly both fairly diligent with paying for the public transport system and carefree if someone doesn't. The seats with different colors (and the color differ from company to company or city to city), are reserved for elder or pregnant or handicapped people, or people with baby in arms. That's for the whole country, not only Vitória. You may sit there, but you should give your seat if someone in these conditions appear. 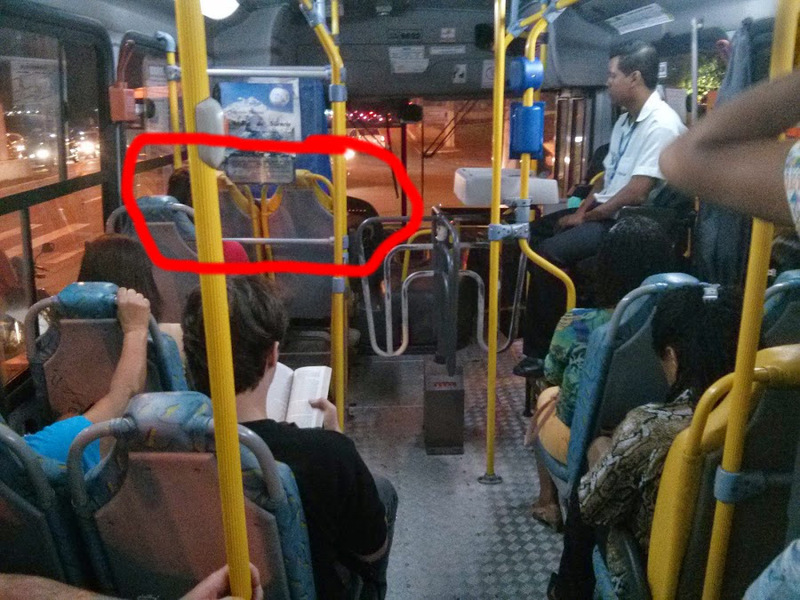 In some countries this doesn't exist because people are polite enough to give the regular seat, but it's not the case in Brazil. In fact, some people sit in the reserved seat and really don't care if an elder person appear. People 65 years old or more or people with special needs don't need to pay the fare, that's why they hop off through the front door. And people who don't pay is normally the people that seat in the front, in these reserved seats, but this is unrelated. You are free to seat in the reserved seats, nobody will think bad about you, as long as you give it to someone that needs. The other seats between the driver and the turnstile are regular seats, like any other after the turnstile. Why do they exist? Well... because there's space in the bus to put seats :) See, in some countries the driver will wait for you to pay and accommodate yourself before starting driving, but not in Brazil: a lot of people come into the bus and the driver won't wait for them to pay the fare and accommodate themselves - s/he has to drive, the bus can't stop - so there's the need to have a big space in the bus to fit the people that just entered. I'd put it differently. Let's say that there aren't any places to sit between the front door and the turnstile. This way, there is less room for people to stay before paying, which is a process that takes time. If there is a line, people will take longer to get in the bus, and the bus will take longer to be able to close the door and leave. Thus, to make the system better, it is better to leave some room for people to wait before going through the turnstile. If there is room, there could be seats. Which seats? 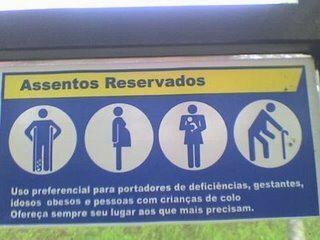 Seats for people that do not pay: elderly, disabled, pregnant women. Other people that take the bus and do not have to pay, such as mailmen and police officers, can use that room before the turnstile as well, bus usually only when the buses aren't crowded. Not the answer you're looking for? Browse other questions tagged public-transport buses brazil or ask your own question.